Excellence, thank you S. Christian….i only started in 2007 but always was allured by the simplicity of .sf2 files….however SFZ fails alot and it will be years before I can program on a high level. Great Read. I’m a musician and I thought this was good reading. Very useful. Thank you! with a lot of fun! hi Christian thank you, your article very helpful for me on next step of my soundfont, iam very disappoint about creative lab i though soundcore 3D are more powerfull DSP rich feature etc it could bring a great plus in soundfont, well i was wrong. they just dropping the support of soundfont on their soundcard after x-fi .its really look down in MIDI world. Indeed vst soundfont plugins are a nightmare. Thanks for the suggestions and the very informative post, it was really needed as there is nothing like it around. Testing your general user sf2, so far I have found awesome patches, it may become by default gm set! Great post man! Usually I don’t leave comments, but you did a great job finding a gem. The bs-16. I’m trying to find something similar to sonar but just now I could find it with your help. Really thanks. you can convert to SF2 via Extreme Sample Converter any kontakt–real guitar any VST with the tempo of your midifile. and less cpu to use!! long live to Sf2..
http://support.creative.com/kb/ShowArticle.aspx?sid=112387 yup, they no longer have soundfont support. It says right on their website. The Audigy is old card but still listed as current. How much longer Creative will support soundfonts in hardware is anyone’s guess. Interestingly, 2.4 seems to be gone. As I say there, I am very interested in using GeneralUser in combination with FluidSynth in order to teach instrumentation and synthesis to kids using free, readily-available tools! Thanks for your article. I’m an avid sf2 user and designer, particularly for iOS devices (iPhone/iPad) and am convinced the soundfont technology is still very worthy of support in 2016. For those who have tried SampleTank, Korg Module, iGrand or ThumbJam etc you probably found, like me, they all leave you wanting. You might be surprised that that free sf2’s can sound a whole lot better if a bit of work is put into their design. I’m happy to share these from my site if anyone is interested. Although VirtualMidiSynth is really just a virtual GM/GS device, the underlying Bass/Bassmidi libraries can do much more. It is constantly evolving, latest version added basic modulator support. You have to copy all the dll’s to the same folder. I’m not sure how many people still use SoundFonts, but I still like to use them from time to time. Quality varies I’ve noticed. You guys should try the vst tx16w, seems to work really good so far, no complains, the best option I have found. – Thanks for the thoughtful, useful blog post. – I’m just starting out. – I (and friends) want to create an electronic concertina that does away with the need for the reds, levers, valves. AND we want it totally portable, with internal battery, and speakers. – I paid a MIDI cards designer to create a MIDI controller to emulate the buttons (one wire per button, and it delivers MIDI signals). Next I want a sound module – probably available for general MIDI, but I have an SF2 file for an excellent concertina sound, and another for an accordion sound. Do you have any ideas about what to get? The Adafruits people have a MIDI card with amp for speakers, but nothing that’ll drive SF2 files. Perhaps something like this might be what you are looking for? Thanks, I’m looking at it. Perhaps I can pay someone to convert my .SF2 into the Dream 5000 format. Have you considered using a tablet computer as a sampler module? I have been using cheap windows 10 tablets with great success as sound modules with an EWI USB electronic wind instrument. – I’m moving away from SoundFont files. I’m using the known concertina SF2 to create WAV files. – I want the Concertina Nova to be completely self-contained – all the electronics, battery and speakers inside the concertina. No wires, extra devices. And ‘guitar-cheap’ – aiming for retail price US$300. – That makes it suitable for teenagers to take hiking with friends for several days, play it round the campfire, in the hut with no need for mains. Hello christian can you possibly compare /add these other ones to your tests? some of these are mentioned in the comments. I messagged the dev for TAL and he said his synth only imports a few parameters. I’d also like to take the opportunity to ask; does Vienna differ from the EMU APS interface, judging by the screenshots of APS, it seems like an entirely different interface, anyone know? 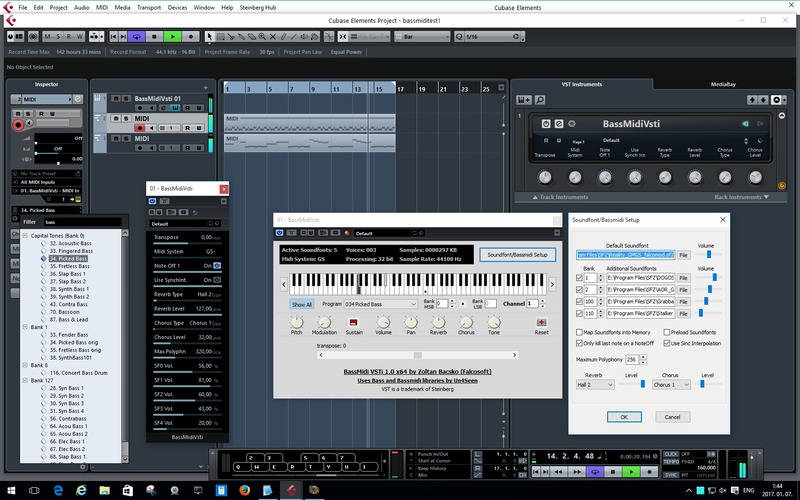 VirtualMIDISynth uses the BASS library, so I would imagine that BassMIDI would have similar SoundFont compatibility to my VirtualMIDISynth test results. The other two samplers you mention aren’t really SoundFont synths, so I didn’t consider them for my testing. There are many samplers out there that can import SoundFonts, but with programs like TX16Wx, a conversion process is used to convert the sound bank into the plugin’s native sampler format, and compatibility with the SoundFont spec is usually very low. Regarding your question about Vienna: I’m not sure, since I’ve never seen the E-MU APS interface. So theres conversion, makes sense. Thanks for the info! As for APS heres a picture of it, does it look similar? I should ask creative/EMU to see if any of this is the same under the hood. I might consider playing with an EMU ESI in the future, but if APS is more or less the same but in mouse/screen interface with vienna features built in then that would save time… over having to, sample, export fonts to the ESI and play with the ESI buttons etc. My mistake thats a sreenshot of Emulator X, not APS. I still use soundfonts with FL Studio with results comparable to those achieved through more expensive vst’s. Have you tested Sforzando? It’s a sfz-centric synth, but apparently supports sf2 to some degree (one preset at a time though). Last I tested, Sforzando converts the SF2 into its own sampler format. Any advanced modulator usage, etc. is going to be lost in the conversion. As far as SFZ files go, however, Sforzando is my go-to sampler. I know you already talked about tx16wx, and even if it does convert on the fly as it seems to do (feels like is not converting at all), I find it very stable and patches play just rigth so far. Maybe you can have a second look at it? I use your GeneralUser sf2! While I’m here, if anyone can recommend a VST plugin which can come close to reproducing the amazing (IHMO) quality of the general midi instrument set of the old AWE32 cards, I would love to know about it, including pay-for VST’s. Thanks! I want those strings again!!! Quite late to the discussion, but would anyone happen to know if something like Keppy’s Synthesizer fully supports the Soundfont spec? It’s the one that I messed around with about a year ago, and I’m also still looking into understanding the possibilities of the Soundfont format. Keppy’s synth uses the Bassmidi library so will sound like Coolsoft, or anything else that uses that. I did have issues with Keppy’s synth where it wouldn’t receive sysex, so doing something like a reset was impossible for me. And yes, OmniMIDI does fully support the SoundFont 2.x standard. It has partial support for SFZ too. Hello Christian and everybody, I am a musician, user of your soundfonts that comes integrated in the bs16i app on the iPad and iPhone, I want to thank you for your useful and great soundfonts. I also have in the computer the bs16 and the old but magnificent Jescola XS1. I work a lot with soundfonts and for me it’s the best option because you can make your own creation / modification of sounds and use them in any kind of electronic music.